Under his direction, the Council held four statewide conventions political during presidential campaigns in 2000 and 2004, and the state Gubernatorial campaign of 2001, as well as several significant rallies and demonstrations during off-years tied to specific advocacy issues. The results of those efforts dramatically bolstered the state’s progress toward empowering people with developmental and other disabilities to get actively involved in advocating for their own political futures. The Council’s Monday Morning Project promoting advocacy by and for people with disabilities paralleled the international People First groups that are still growing and exerting their influence worldwide, eventually joining that movement. As an infant, Ellis was diagnosed with cerebral palsy. At two his parents reluctantly enrolled him in a new holistic program with then innovative approaches to occupational and physical therapy in Florida. He would spend up to six months a year at this program, often without either of his parents, until he was eight years of age when he entered the New Brunswick public school system. He often spoke of his memories from this period and the emotional trauma it caused him as a young child. As difficult as those experiences were, they fueled his passion for changing societies paternalistic attitudes towards people with disabilities. Ellis believed that it wasn’t enough to provide services, housing and “daily activities,” for people with disabilities. Those individuals needed to be afforded the same opportunities to provide for themselves and have access to the assistance they needed to do so, the same as any other citizen. A key area for opening up those opportunities for him both personally and professionally was in education. Ellis graduated from Highland Park high school in 1952 and went on to graduate from Oberlin College 1956. He moved to New York City, which began a long love affair with the alternative culture of that unique community. He earned his MA in Vocational Rehabilitation from New York University in 1958. His educational accomplishments opened up career paths for him that were not available to many people with disabilities in those times. He made the most of them. In 1968 he joined the NJ State Economic Opportunity Office supporting local community action agencies and anti-poverty programs. In 1977 he was named Deputy Director of the Division of Advocacy for the Developmentally Disabled in the NJ Department of the Public Advocate, the first such division in the country. The next fifteen years he was engaged in a frenzied series of activities that led to great strides in legislation supporting the rights of people with disabilities. He was a regular on the Trenton-DC Amtrak circuit, testifying before Congress on a number of successful legislative initiatives, including helping to draft the Transportation Title of the Americans with Disabilities Act. "Justin and I had a profound love, admiration and respect for Ethan and for his vision, militant advocacy strategies and concrete actions. He will be solely missed. We were so privileged and proud to work with him for so many years." He led a movement in the early 1990s to restructure the state’s Developmental Disabilities Council so that individual’s with disabilities and their families had a more significant and effective presence on the body, as dictated by the DD Act, the federal legislation establishing a framework for the rights of people with developmental disabilities and creating the councils nationally. Following the success of that movement he became director of the newly restructured council. Ellis and the Council partnered with the state’s Division of Developmental Disabilities to reduce the reliance on large institutions for residential services for people with developmental disabilities. In the wake of the Willow Brook scandal, where undercover reporting exposed some of the outrages possible when people are warehoused in large institutions with poor oversight, as was the case in that New York facility, there rose up a cry to scale back the large institutions. By the mid-90s New Jersey had not followed those national trends until the council and the division agreed to move ahead with the closure of two of the state’s developmental centers. This progress would not have been possible without Ellis’ tireless efforts to keep it moving in the face of significant opposition from center staff organizations and some parents’ groups afraid of any change of their sons and daughters’ situations despite the evidence of its overall benefits. During his time at the council, New Jersey was also lagging behind federal guidelines for including students with disabilities in regular classrooms with their peers with the supports they needed to thrive in those settings. Ellis threw his support behind those efforts and he and the council’s staff were principal players in that effort—publishing two reports that detailed how “Separate and Unequal” the state’s educational system was for students with disabilities and how much that not only effected the individual but how it diminished the educational experience of all students. Ellis retired from the State of New Jersey in 2006. In 2008, he was named Executive Director of the Alliance Center Independence and later founded NEXT STEP, an organization that seeks to transition the advocacy for people with disabilities to an assertive political activism. 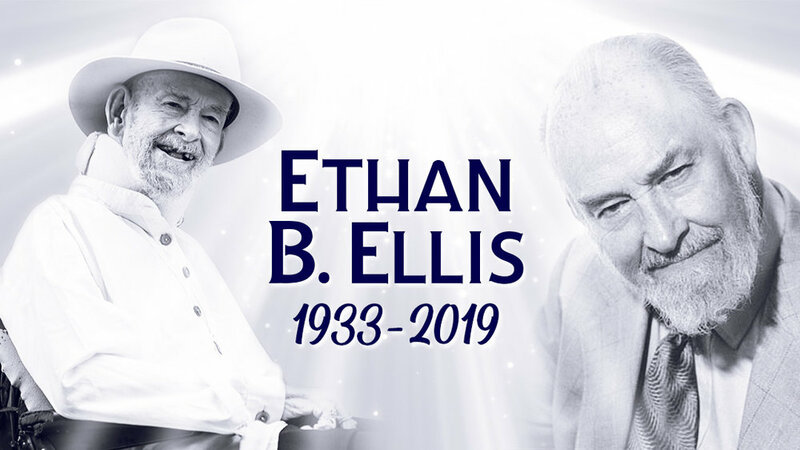 Ethan has been recognized many times for his sense of mission and determination, most recently as the first recipient of an award named after him: The Ethan B. Ellis Award for Lifetime Achievement. He was presented this award this past fall at the 8th annual NJ Disability Pride Parade, organized by ACI. Love came late in life to Ethan. It was during the period above when he met, fell in love with, and married Janet Chiorello. They were blessed with a son, Ethan James, who was born in 2006. One of Ethan’s great joys was getting to see his 100 year old mother with his son in her arms. At his request, there will be no official services at this time. A memorial service for family and friends to celebrate Ethan’s life will be held at ACI, 629 Amboy Ave, Edison, NJ on May 17th from 1 to 4 PM. Visit our events page for more info and to RSVP. In lieu of flowers, his family requests that donations be made to the Alliance Center for Independence. Visit our Support ACI page for the many ways you can make a contribution. If you made a donation through PayPal, please let us know. “Ethan is a man that I have always been in awe of. I am proud and honored to have worked with him for close to 15 years. He was my mentor, my teacher and is my friend. When I was in my 20’s I went to a presentation, my son was recently diagnosed with Autism. Ethan was speaking on disability rights. I walked out of that presentation questioning everything I thought I knew about disability, which turns out, was basically nothing. A few years later I had the honor of working for him. He challenged me and those he worked with. He was tough and demanded a lot from us because he saw potential in everyone. Luke and I worked with Ethan at the NJ Council on Developmental Disabilities where he was the Executive Director. I always tell the story of how we went into Ethan to pitch an idea. Ethan wasn’t having it. He kept telling us it was a bad idea. I was getting madder and madder almost to the point of crying when I heard Ethan laughing. I said why are you laughing at me and he said “I wanted you to prove me wrong, and you did”. I was furious with him but that was Ethan, he would push you to the limit and make you do the work. Ethan Ellis, Civil Rights leader and visionary. He marched with Martin Luther King Jr. in the famous Washington March in 1963 and was at the signing of the Americans with Disabilities Act. His friends Justin Dart, Bob Kafka to name a few. It was a treat when they would come to NJ to listen to them talking about social and economic justice. 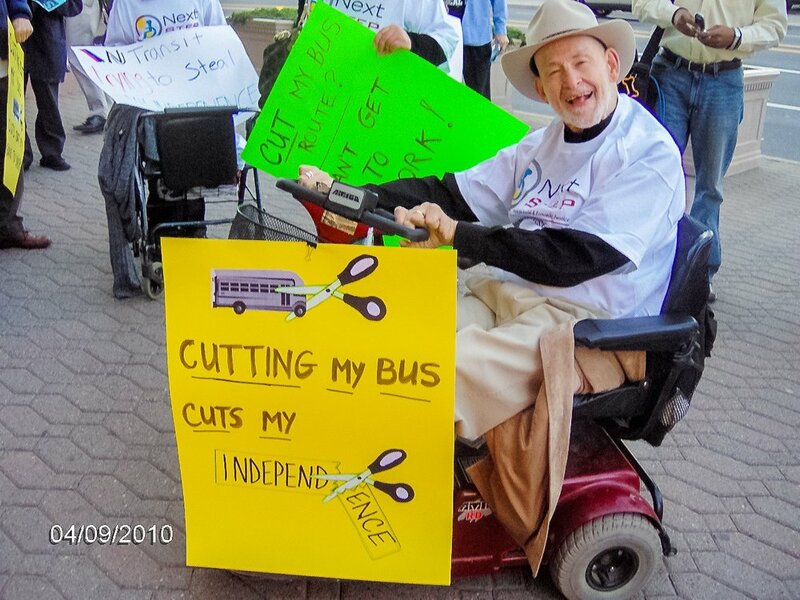 Ethan Ellis, disability advocate/activist, past Executive Director of the NJCDD and ACI as well as the Deputy Director of the NJ Protection and Advocacy. Rehab Counselor, writer, community organizer, lecturer, visionary. His resume goes on and on. He was a fighter which did not always make him friends. You would not want to be on his bad side! But he succeeded in advancing the rights of the disabled community in NJ while teaching others how to advocate for themselves. He taught Luke and I that it is always better to be right than to be popular. Ethan was a story teller and people loved to listen to him. We used to say Ethan was holding court again. What most people did not know is that under that obstinate exterior is a very big heart. We will be collecting quotes, pictures, and stories for Ethan’s memorial. We encourage you to share in the comment section below!